It is mentionned that the Barbet was re-built with a lot of different breeds...(which is not necessarily true as some of you may have read here before) There are some barbet who don't even have any Barbet blood*, but were fallaciously called Barbets, one just needs to look at foundation on some pedigree databases.. 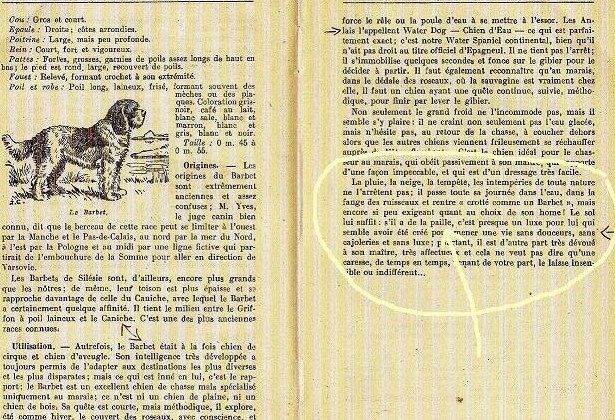 Nor has it ever been prouven that the Barbet had disappeared after WWII as there were some around, and even our newly elected Barbet responsible's father who worked in Paris after WWII, saw some so the breed was never extinct by any stretch of the imagination. The SCC members knew they existed and also were aware that, as many breeds severely damaged after the war, it would take time to rebuild. 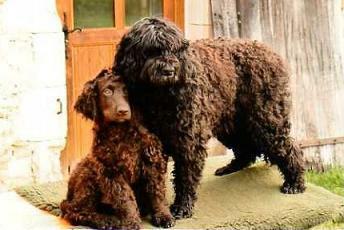 Hercule di Barbochos de Reiau de Prouvenco, pilar of the Poppenspaler's breeding of our beloved Honorary member of the club, M. Rainier T Georgii, who sired a litter( Hercule, not Georgii) damed by an Irish Water Spaniel and registered in the Netherlands since 2003.He is shown here with one of the pups confirmed as an IWS. Why was this done? This is typical information for breeders, but since this mixing business is now on the SCC website, you certainly are entitled to an explanation...There was epilepsy in a line of IWS and the Barbet being a healthy breed, was used...to get new blood and eliminate the epilepsy. Lots more coming up. However, the pedigrees do not show a lot of the information as they should. Let's hope for that in the near future. Knowing that Lynx and Serinoire were alledgedly Barbet "typed" and not Barbets. thank you Tomasz and Piotr! He's becoming a water...dog!I'd also like to insist on the character of my pups. As you can see, they are always happy and playful. Not an aggressive bone in their body with children, adults or other dogs.This is one of the advantages of videos as you can really see their behaviour which a static photo, no matter how well set up it is, can't prouve. Enjoy! Thank you Anthony, Debby and family! Thought you might enjoy this. Snow, rain no weather condition bothers him. He can spend the day in water.He is not a demanding dog, some straw for a bed is luxurious for him...he was created to lead a life without any softness or kindness,even though he is very devoted to his masters and becomes rapidly very attached.We can say that that certainly has evolved in this rustic dog's life! I have this photo and I have no clue who it is. If someone could point me in the right direction, I'd appreciate it! A French national treasure? Did I really say that? was it me or? 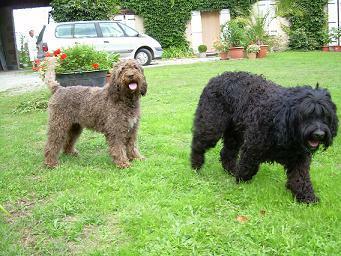 The Barbet: French water dog is a rustic dog, guys.rustic. And yes, after WWII, there were only a few left, but there were some and they were Griffons and never got any poodle blood added, back then. Visualize a Griffon looking like a poodle?